School Pieter van Bloemen (Flemish, 1657-1720) Oil on Canvas "Hunting & Ruins Scene". 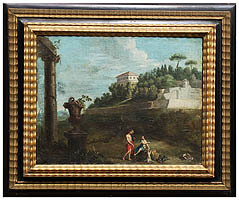 The capriccio scene depicting two male hunters in robes, one standing holding a musket, the other seated holding his prey, Roman ruins on one side and a large Village in the background, within an ebonized and parcel-gilt frame. Unsigned. 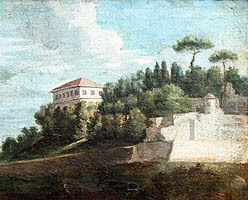 Circa: 19th Century. Pieter van Bloemen, also known as Standaart (bapt. 17 January 1657 - 6 March 1720), first name also spelled Peter or Peeter, was a Flemish painter. He was a gifted landscape and animal painter and was very successful with his compositions depicting equestrian, animal and market scenes. Van Bloemen was born in Antwerp. 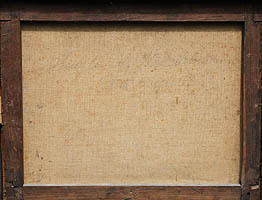 He was a pupil of Simon Johannes van Douw, according to some historians already from the age of 10. He became a master of the local Guild of Saint Luke in 1674 at the age of 17. He had two younger brothers who were also painters: Jan Frans and Norbert. At some point he travelled to Rome. This possibly happened in the year 1674 or later in the year 1689. He was in 1684 in Lyon in the company of the Dutch painters Adriaen van der Cabel and of Gillis Weenix. His brother Jan Frans joined him in Lyon. A prolific painter, van Bloemen was at his best painting animals, although he also produced a wide range of landscape, genre, equestrian, military and history scenes. 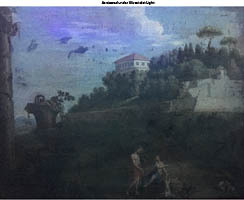 He carried on the tradition of Italianizing landscape paintings of the Roman Campagna representing inns, ruins and animals. 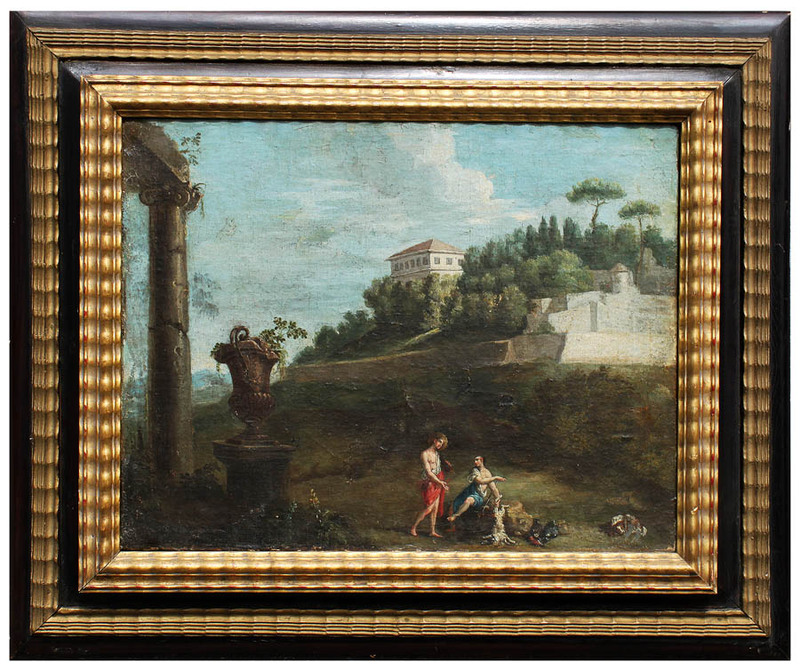 A portion of his output paintings also stand in the tradition of the 'bamboccianti', a group of mainly Dutch and Flemish artists active in Rome whose small works depicted trivial or base subjects. Pieter van Bloemen, also known as Standaart (bapt. 17 January 1657 - 6 March 1720), first name also spelled Peter or Peeter, was a Flemish painter. He was a gifted landscape and animal painter and was very successful with his compositions depicting equestrian, animal and market scenes. Van Bloemen was born in Antwerp. He was a pupil of Simon Johannes van Douw, according to some historians already from the age of 10. He became a master of the local Guild of Saint Luke in 1674 at the age of 17. He had two younger brothers who were also painters: Jan Frans and Norbert. At some point he travelled to Rome. This possibly happened in the year 1674 or later in the year 1689. He was in 1684 in Lyon in the company of the Dutch painters Adriaen van der Cabel and of Gillis Weenix. His brother Jan Frans joined him in Lyon. A prolific painter, van Bloemen was at his best painting animals, although he also produced a wide range of landscape, genre, equestrian, military and history scenes. 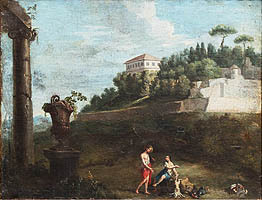 He carried on the tradition of Italianizing landscape paintings of the Roman Campagna representing inns, ruins and animals. 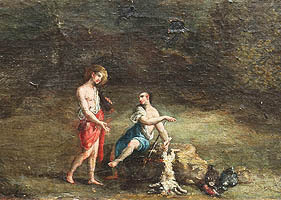 A portion of his output paintings also stand in the tradition of the 'bamboccianti', a group of mainly Dutch and Flemish artists active in Rome whose small works depicted trivial or base subjects.